Khalil Deek. Suspected of masterminding the Los Angeles airport plot (see December 15-31, 1999) and a Jordanian millennium plot (see December 11, 1999), Deek was investigated by US intelligence since the late 1980s (see Late 1980s) but inexplicably never even watchlisted until 2004 (see Spring 2004). Deek’s brother says Khalil lived in Bosnia for a while, working for a “Muslim relief organization.” [Washington Post, 3/11/2000; Orange County Weekly, 6/15/2006] He worked for the IARA, which reportedly funneled weapons and recruits into Bosnia (see Early 1990s). Hamid Aich. He lived in Canada and is connected to Ressam’s group (see December 21, 1999). He also will openly live in Ireland and apparently fund a wide variety of militant groups and plots there before escaping to Afghanistan just before 9/11 (see June 3, 2001-July 24, 2001). 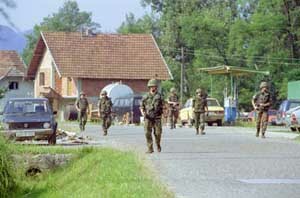 Other mujaheddin connected to this village are wanted by authorities in other countries for other alleged crimes. A senior US official will say, “We have been concerned about this community for years. We flushed out a lot of them [after the end of the war].… [But] we find the whole group of them a threat, and we want them out of there.” [Washington Post, 3/11/2000] Others tied to the millennium plots have ties to Bosnian war generally because Ressam belonged to a group of armed robbers called the “Roubaix gang” that trained in Islamic camps in Bosnia. [Los Angeles Times, 1/13/2000] Izetbegovic will step down as leader of Muslim Bosnia in October 2000. [New York Times, 10/20/2003] In late 2000 and early 2001, the mujaheddin will gradually be moved out of the village and replaced by the original Serbian inhabitants.